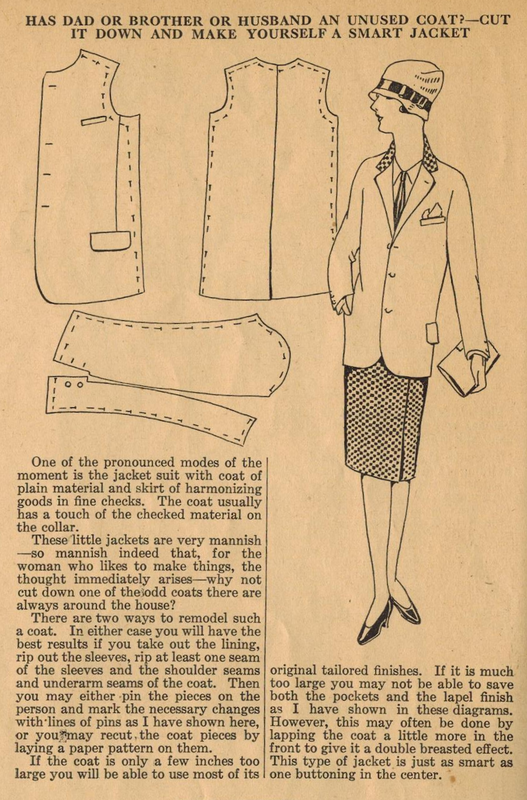 As long as we are on the subject of refashioning old clothes into new, this post from Ruth Wyeth Spears and the 1920s is very timely! In this article, Ruth describes how to make a new "mannish" jacket for yourself from an old jacket of your husband or brother or dad. She describes two ways to go about it, depending on the size of the old jacket you are working with and the size you need. Autumn is the perfect time for tailored jackets and blazers, so definitely give this a try! Interesting! And interesting too that the matter of the buttonholes being on the wrong side for a woman is not mentioned at all. So interesting of you to notice that! It is true, if you make-over a man's suit into a woman's suit, you will get the buttons and buttonholes on the "wrong side". I've always wondered, who decided that men should button from one side, and women the opposite? It seems a bit silly, but there must have been a reason.